LIMA, EDIRLEI SOARES DE ; Feijó, Bruno ; BARBOSA, SIMONE D.J. ; FURTADO, ANTONIO L. ; CIARLINI, ANGELO E.M. ; Pozzer, Cesar T. . Draw Your Own Story: Paper and Pencil Interactive Storytelling. Entertainment Computing, v. 2013, p. 1-9, 2013. Pervasiveness can be recognized in a game by its boundaries that expand every time it is played, from the virtual (or fictional) world to the real world. Pervasive games are a new form of digital entertainment that has evolved in different forms, such as alternate reality games, transmedia games, and crossmedia games. Sensor technologies, networking capabilities, augmented reality systems, computer vision technology, the internet, and, especially, mobile devices have been responsible for the rapid evolution of this new form of digital product. We bear in mind that mobile devices are currently the main driver for fulfilling the promises of pervasive game playing. Our investigations and experiments on this class of games have the objective of to enhance the insight into pervasiveness and to reveal important guidelines for game designers and programmers. Valente, L. ; Feijó, B. ; LEITE, J. C. ; Clua, E. A method to assess pervasive qualities in mobile games. Personal and Ubiquitous Computing (Online), v. 1, p. 1-24, 2017. New VFX processes are investigated to fit the low budget of TV production without deteriorating simulation quality. This is a project under NDA (Non-disclosure Agreement); therefore, not all results can be accessed. A method for rea l-time object tracking in high-definition (HD) videos is investigated. There are few works in the literature considering HD and multiple objects in real time. Good solutions for this problem are of paramount importance when we have interactive hot spots and real-time compositing processes in interactive digital television. Moreira, G.C.G. A method for real-time object detection in HD videos using frame segmentation and foreground integral image. PhD Thesis, April 2014, Dept. of Informatics, PUC-Rio. [in Portuguese]. Comics are a unique and cl assical form of storytelling. The advent of interactive narratives brings the possibility of interaction to the traditional comic books. In this project we search for an interactive comics system that is capable of generating dynamic interactive narratives in the format of comic books. The system should allow users to interact with certain objects and to observe the consequences of their actions in the unfolding story. Soares de Lima, Edirlei ; Feijó, Bruno ; FURTADO, ANTONIO L. ; Diniz Junqueira Barbosa, Simone ; Pozzer, Cesar T. ; Ciarlini, Angelo E. M. 2013. Non-branching Interactive Comics. Lecture Notes in Computer Science. 1ed.Boekelo: Springer International Publishing, 2013, vol. 8253, p. 230-245. 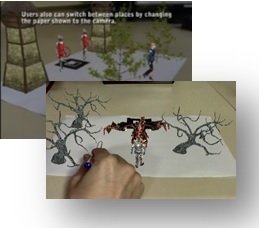 Usually, interactive storytellin g systems adopt computer graphics to represent the virtual story worlds, which facilitates the dynamic generation of visual content. Although animation is a powerful storytelling medium, live-action films are still attracting more attention from the general public. In addition, despite the recent progress in graphics rendering and the wide-scale acceptance of 3D animation in films, the visual quality of video is still far superior to that of real-time generated computer graphics. In this project, we propose a new approach to create more engaging interactive narratives, denominated “Video-Based Interactive Storytelling”, where characters and virtual environments are replaced by real actors and settings, without losing the logical structure of the narrative. Lima, E.E.S. 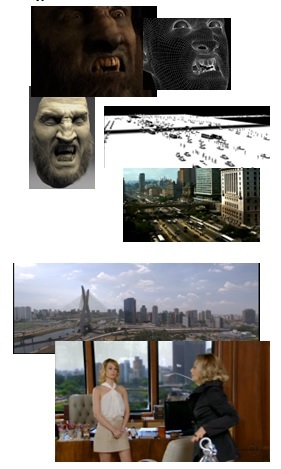 ; Feijó, B. ; FURTADO, A. L. Video-based interactive storytelling using real-time video compositing techniques. MULTIMEDIA TOOLS AND APPLICATIONS, v. 1, p. 1-25, 2017. doi. PDF. Lima, E.E.S. 2014. 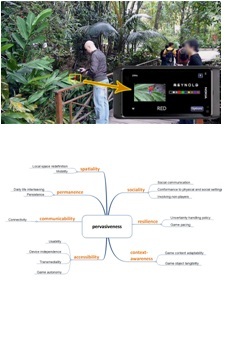 Video-based Interactive Storytelling. PhD Thesis, Dept. of Informatics, PUC-Rio, August 2014. PDF. This project searches for ne w models of school where a research center and a production center live in a symbiotic manner. Structural changes in the traditional school model must be identified. These changes are imperative if we are to keep that subsystem of society up with the contemporary world. This project investigates particularities of Brazilian technical secondary schools and focusses on programming learning, computational thinking, and multimedia languages that should be present in educational processes. This project was initially a partnership with Oi Futuro (2009 – 2015), which created the NAVE (Nucleus of Advanced Education) – NAVE was also a Microsoft World Tour School (see #28). People: Main Researchers – Monica Costa, Bruno Feijó, Andréia Resende.